It started with cauliflower rice, grew rapidly with cauliflower pizza bases – but now I think we’ve reached peak floret-fabulousness. Cauliflower is officially cool. In the last few weeks when I’ve been out and about I’ve seen it popped into salads, tossed in buffalo sauce as a vegan alternative to chicken wings and even served stand alone, out and proud, as a grilled steak (with mash). 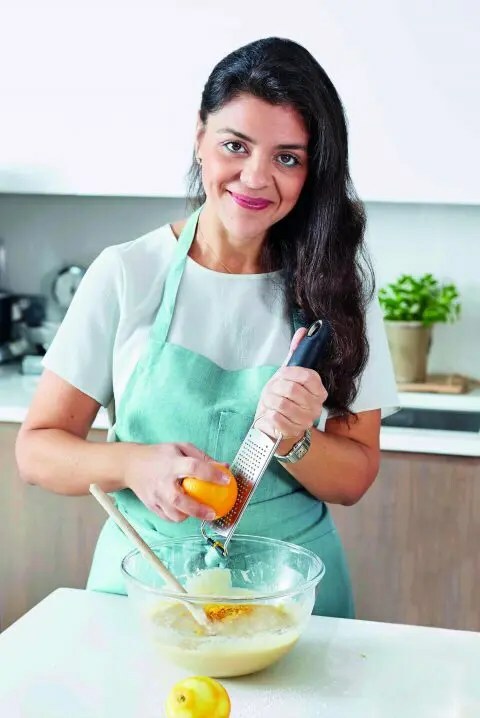 You can also make popcorn with it (which I tried on here once ) and Lee Holmes, one of the biggest wellness gurus here in Sydney, even uses it to make a healthy ice cream which she tells me is amazing.. I love cauliflower – even when it’s boiled and slightly soggy (all the better to mash it into gravy) or when covered in gooey cheese sauce (totally allowed if I’m doing The High Fat Diet) but I don’t eat it nearly enough considering just how good for you it actually is. After all, cauliflower contains vitamin C – one cup contains just over three-quarters of your daily requirement – and bone-building calcium and vitamin K. Its slightly bitter taste comes from a substance called sulforaphane which has been shown to inhibit enzymes involved in the growth of cancer cells. It also contains a substance called idole-3-carbinol which is linked to a lower risk of breast cancer. Yep, that white vegetable you might pass up for its colourful cousins, is really, really good for you. Top tip – it’s even better if you eat cauliflower with mustard which enhances how much sulforaphane you absorb. All of this is why, I’m pretty glad that cauliflower is trendy – and, I’m also very happy that the trend sees us eating it whole rather than adding it to some juice or another. Juices don’t have fibre people – it’s better to eat your veggies, not drink them. If I’ve not convinced you just yet of the magnificence of cauliflower, maybe Sabrina Ghayour can. That’s her above. 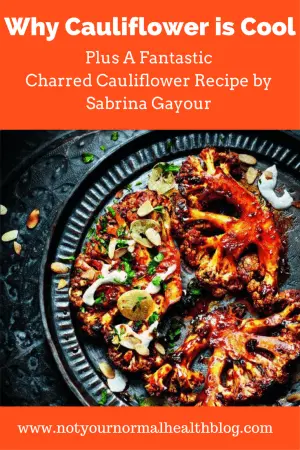 Sabrina is a chef famed for her Persian dishes and uses charred cauliflower in one of the recipes in her new book Feasts. When you char cauliflower it changes the taste completely from that soggy white stuff you might be used to. It goes nutty and sweet and is just incredible. I took one look at the picture (that one at the top) when I saw this and just started drooling – so I was thrilled when I got the okay to print it here ( trust me, no-one wants to cook one of my cauliflower recipes. I can barely eat my own cooking I’m not inflicting it on you guys). It’s beautifully sticky, caramelised to perfection and works just as well as a main dish with something like couscous as it does as a side dish. Go on, give it a try. You can thank me later. And if you’ve got any brilliant ideas for cauliflower dishes, let me know in the comments. I’d really love to hear if you can beat making ice cream, popcorn or pizza with it. Cut away any outer leaves from the cauliflowers, then cut each cauliflower into 4 slices of equal thickness. On the slices cut from the outer edges of the cauliflowers, trim and shave away enough of the curves to create flat surfaces, so that the slices cook evenly. Combine the harissa, honey, olive oil and cinnamon in a small bowl, season with salt and pepper and mix well. Brush or rub the mixture over the cauliflower slices. Drizzle a little oil into a large frying pan set over a medium heat. Meanwhile, mix the tahini with the yoghurt and lemon juice in a bowl, season generously with salt, then stir in a little lukewarm water, 1 tablespoon at a time, until the mixture has a sauce-like consistency. Transfer the cauliflower slices to serving plates. Drizzle over the yoghurt sauce and any remaining marinade, then scatter over the preserved lemon slices, toasted almonds and parsley to serve. If you like the look of this, check out Sabrina’s new book Feasts which is full of yumminess. You’ll find it in bookstores here in Australia. Elsewhere, click here to go straight to buy it from Amazon. 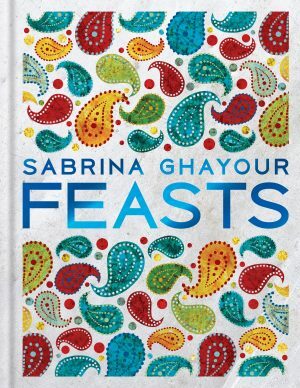 This is an extract from Feasts by Sabrina Ghayour, published by Hachette Australia, Hardback RRP $39.99. Images are by Kris Kirkham. Looking very tasty. Very Helpful..